ST. PETERSBURG, Fla. (January 10, 2018) — The Tampa Bay Rowdies have invited some of Major League Soccer’s biggest stars to St. Petersburg, as they join the Rowdies to prepare for the 2018 season. The Rowdies Suncoast Invitational is one of the premier preseason tournaments in the country and will return to Al Lang Stadium for the third year in a row. The Suncoast Invitational will give the Rowdies the chance to gear up for the USL season alongside Major League Soccer’s Philadelphia Union, D.C. United, Montreal Impact and New York City FC. Fans will be able to see international superstars like David Villa, who won the 2010 FIFA World Cup with Spain, and U.S. Men’s National team stars such as Paul Arriola and Alejandro Bedoya. For the third straight year, the Impact will have an extended visit to St. Petersburg for their preseason training camp. During their time in the Sunshine City, the Impact will call Al Lang Stadium home, using the field, locker room and gym facilities alongside the Rowdies. 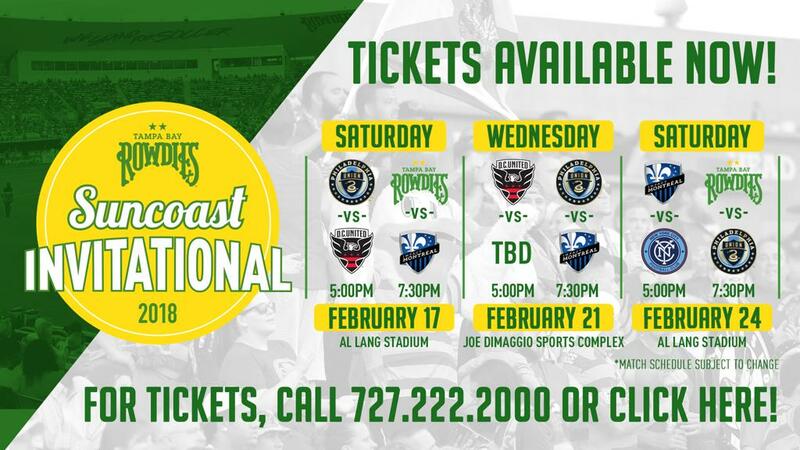 The Rowdies Suncoast Invitational will feature two days of must-watch doubleheaders at Al Lang Stadium, with your Rowdies playing Major League Soccer teams on both February 17 and 24. The general public can purchase tickets for each doubleheader by calling (727) 222-2000 or by clicking here. Tickets to the doubleheaders will start at $15, while the best seats in the stadium right behind the team benches will be priced at just $30. This is your chance to see some of Major League Soccer’s best players for an affordable price! As a thank you to our existing 2018 season ticket holders, we would like to offer free tickets for them to enjoy this exciting tournament. Tickets are valid for both matches on gameday and can be redeemed starting today by contacting the Al Lang Stadium box office at (727)308-5203 or by email at boxoffice@rowdiessoccer.com. Those seats not redeemed by Friday, February 9 at 5 p.m. will be released to the general public. Philadelphia Union vs. D.C. United – 5 p.m.
Tampa Bay Rowdies vs. Montreal Impact – 7:30 p.m.
D.C. United vs. Opponent TBD - 5 p.m.
Philadelphia Union vs. Montreal Impact - 7:30 p.m.
Montreal Impact vs. New York City FC – 5 p.m.
Tampa Bay Rowdies vs. Philadelphia Union – 7:30 p.m.